The Energy Information Administration (EIA) released its weekly data on diesel and gasoline retail prices for the week ended March 27th, 2017. Prices for both fuels declined during the week, following crude prices down, though retail prices remained relatively more robust than crude prices. For the current week ended March 27th, diesel prices declined by 0.7 cents to an average price of $2.532/gallon. 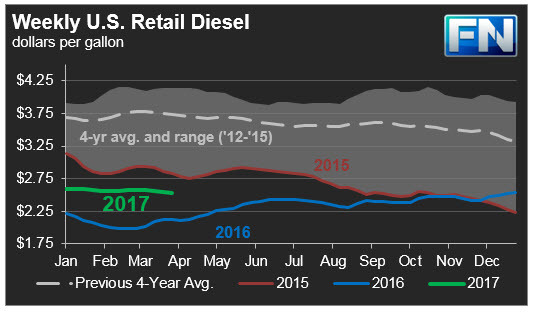 PADD 1 retail diesel prices declined 1.4cts to $2.586/gallon. The largest price decline was in New England, where prices dropped 2.9 cents to $2.593/gallon. Central Atlantic diesel prices dropped by 1.4 cents to average $2.724/gallon. Lower Atlantic prices declined by 1.1 cents to average $2.487/gallon. Overall PADD 1 prices were 40.7cts/gallon above their prices for the same week last year. PBF Energy will be shutting a 46 kbpd diesel hydrotreater at its 160 kbpd Paulsboro, New Jersey, refinery, for a three- to four-week maintenance period. Phillips 66’s 238 kbpd Bayway, New Jersey, refinery, is running at very low throughput. It has met with delays that will push back the restart by another 8-10 days. It was scheduled to restart in mid-March, including its crude unit, its 145 kbpd cat cracker, its cat reformer, and its diesel hydrotreater. In the Midwest PADD 2 market, retail diesel prices declined 0.6 cents to average $2.458/gallon. This price was 38.1cts/gallon above its level for the same week last year. Phillips 66 is nearing completion of the turnaround on the 110 kbpd crude unit at its Wood River, Illinois refinery. In the Gulf Coast PADD 3, retail diesel prices edged down 0.2 cents to $2.378/gallon. This price was 37.7cts higher than in the previous year. Shell announced that it would close the 60 kbpd hydrocracker at its 340 kbpd Deer Park, Texas refinery for a planned overhaul. Motiva announced that it would be shutting down its hydrocracker and cutting crude runs at its 230 kbpd Convent, Louisiana, refinery, for a period of around four weeks. This is to finalize repairs on a fire-damaged section that has been closed since August. HollyFrontier’s 100 kbpd refinery in Artesia, New Mexico, is down for maintenance, as is Marathon Petroleum’s 84 kbpd Texas City refinery and Valero’s 95 kbpd refinery at Three Rivers, Texas. In the Rocky Mountains PADD 4 market, retail diesel prices increased 0.7 cents to $2.597/gallon. This price was 50.3cts higher than in the prior year. Suncor’s 103 kbpd refinery at Commerce City, Colorado, was closed because of a full-plant power failure. Safe startup was expected to take several days. In the West Coast PADD 5 market, diesel pump prices declined by 0.4 cents to average $2.822/gallon. This price was 50.7 cents above its level last year. Prices excluding California rose 0.1 cents to $2.703/gallon, which was 52.6cts above the retail price for the same week last year. California diesel prices declined by 0.9cts to an average price of $2.919/gallon, 49.4cts higher than last year’s price. Prices were influenced by downtime at one of the hydrocrackers (20 kbpd capacity) at the 77 kbpd Phillips 66 Rodeo refinery near San Francisco. Phillips 66’s 100-kbpd refinery at Ferndale, Washington was down for an overhaul. 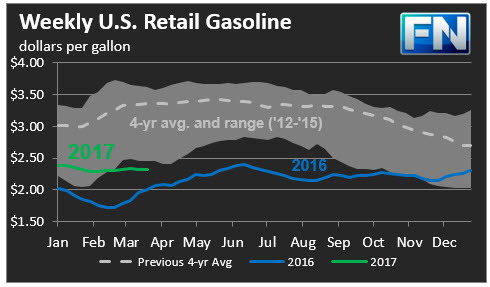 US retail gasoline prices declined by a modest 0.6 cents for the week ended March 27th, to $2.315/gallon. This price was 24.9 cents higher than for the same week in 2016. In the East Coast PADD 1, prices for gasoline increased by 1.0 cents to $2.276/gallon. This price was 25.6cts higher than last year’s price. Prices edged up 0.2 cents in New England to $2.263/gallon. Central Atlantic market prices declined by 0.8 cents to $2.372/gallon. Prices in the Lower Atlantic market jumped by 2.4 cents, to bring prices to an average of $2.207/gallon, 21.2cts higher than last year’s average price. PBF Energy’s cat reformer at its 190 kbpd Delaware refinery was briefly down during the week. In the Midwest PADD 2 market, gasoline prices dropped 3.7 cents to average $2.184/gallon. Gasoline pump prices were 22.7 cents higher than they were one year ago. A fire at PBF Energy’s 188 kbpd Toledo, Ohio, refinery, shut down the plant, and it completed a restart during the week. In the Gulf Coast PADD 3 market, gasoline prices rose 1.5 cents to average $2.087/gallon. Prices for the week were 22.4cts higher than for the same week in 2016. LyondellBasell’s Houston refinery continues to work on repairs to the cooling unit at its 110 kbpd cat cracker, which was seriously damaged by a fire. This unit is likely to be out of commission until the middle of April. Total resumed operation of the 80 kbpd cat cracker at its 240 kbpd refinery in Port Arthur, Texas. Citgo is continuing maintenance at its Lake Charles, Louisiana refinery, scheduled for completion in early April. In the Rocky Mountains PADD 4 region, gasoline prices edged down 0.1 cents to average $2.303/gallon. This price was 35.6 cents higher than at the same time in 2016. Suncor’s 103 kbpd Commerce City, Colorado, refinery has been delayed in restarting after a March 11th power outage. In the West Coast PADD 5 market, retail gasoline prices decreased 0.1 cents to an average price of $2.848/gallon. This was 27.8 cents higher than at the same time a year ago. Excluding California, prices rose by 0.4 cents to an average of $2.59/gallon. This was 38.4 cents higher than at the same time in 2016. California prices declined 0.3 cents to an average pump price of $2.998/gallon. Prices were 21.6 cents higher than last year’s price for the same week. Los Angeles prices increased by 0.2cts to average $3.028/gallon. San Francisco pump prices eased by 0.4 cents to average $3.045/gallon, 25.2 cents above last year’s price. Seattle prices dropped 1.6 cents to average $2.817/gallon, 51.0cts higher than prices one year ago. Phillips 66’s 100-kbpd refinery at Ferndale, Washington was down for an overhaul. PBF Energy’s 149 kbpd Torrance refinery ran at reduced throughput again after trouble at its VGO hydrotreater, which resulted in heavy flaring. The unit is scheduled for seven weeks maintenance in late April-early May, during which time the FCC will be run at reduced rates, constraining gasoline output. Chevron’s El Segundo refinery came back onstream.